Searching for a roasted vegetable recipe with a little something extra? Then, you must try our Roasted Vegetables with Creamy Sriracha Dip. 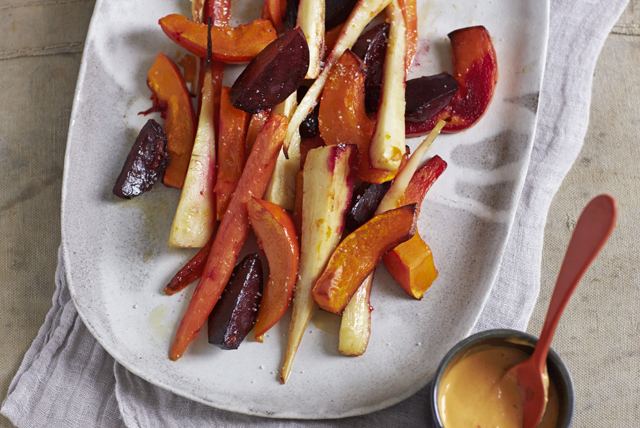 The combo of roasted squash, parsnips, carrots and beets paired with an easy Sriracha dipping sauce is a winner! Toss vegetables with Italian dressing; spread onto parchment-covered rimmed baking sheet. Bake 40 to 45 min. or until vegetables are tender. Meanwhile, mix remaining ingredients until blended. Serve vegetables with Sriracha dip. Serve with hot steamed green beans and your favourite roasted meat, such as chicken, beef or pork. When handling cooked or canned beets, it's easy to stain your hands and cutting board a bright pink from the juices. To prevent this, wear disposable latex gloves when handling cooked beets and cut them on a large glass or ceramic plate rather than on a cutting board.